Berkshire Opera Festival staged its first production, Madama Butterfly in 2016 and followed with Ariadne auf Naxos last summer. They have kept up the high standards set with those productions in this Rigoletto. The orchestra and chorus of musicians from the region performed admirably and the principals are an international cast with outstanding resumés. The duet is almost enough to persuade the Duke to become faithful to one woman. 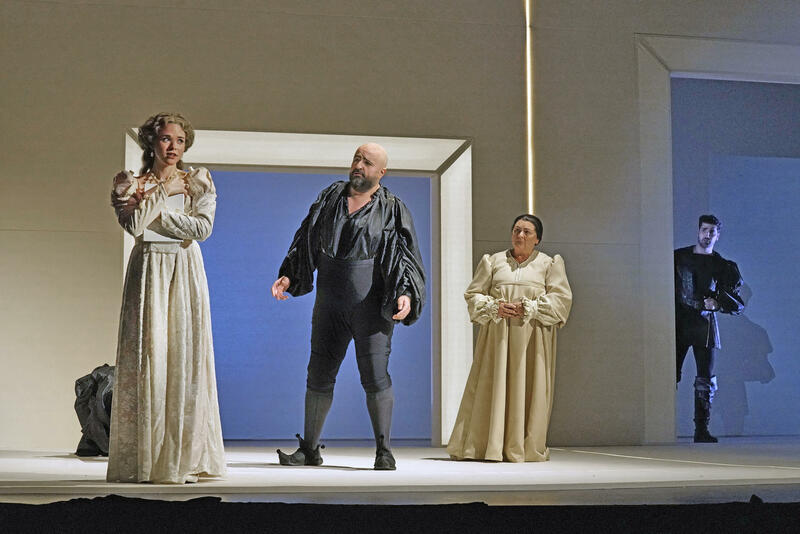 They are led by Sebastian Catana, a specialist in Verdi baritone roles with a powerful voice, who conveyed the title character’s biting satire of his role as court jester, and the loving and protective father to his daughter, Gilda, as well as the grief and outrage at her humiliation at the hands of the Duke. Soprano Maria Valdes made an affecting Gilda, trembling with excitement at learning that the handsome man who has been eying her in church seems to be genuinely interested in her. They have a lovely duet together, then when he has gone she tenderly sings the famous aria “Caro nome” in praise of his “dear name.” The duet is almost enough to persuade the Duke to become faithful to one woman. 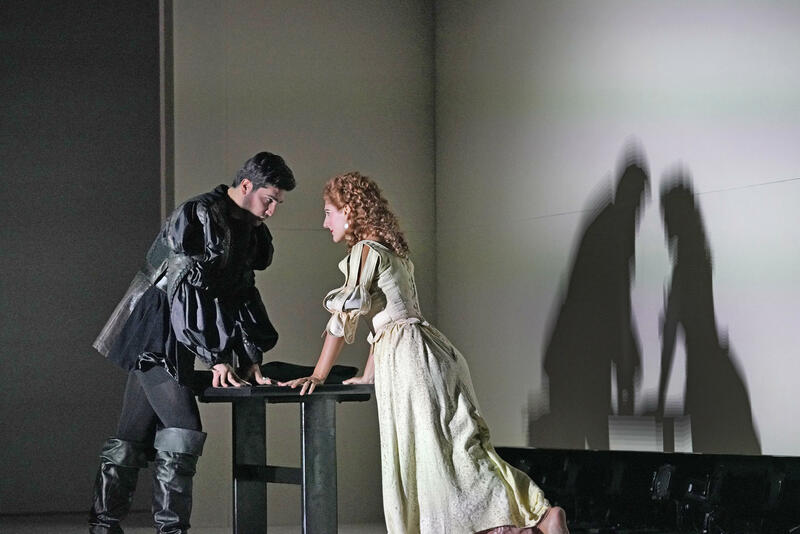 Jonathan Tetelman, who made his Tanglewood debut last month as Rodolfo in La bohème, made the Duke seem almost sincere in that thought, though he quickly reverted to type when he discovered that the young woman abducted by his courtiers, thinking her the mistress of Rigoletto, is Gilda, and he takes full advantage of her. He expresses his philosophy towards women in two famous arias, “Questa o quella,” announcing right from the beginning that he will pursue any woman he desires, and “La donna è mobile,” in which he declares that all women are fickle and will betray any man who loves them. Both arias are splendidly sung. 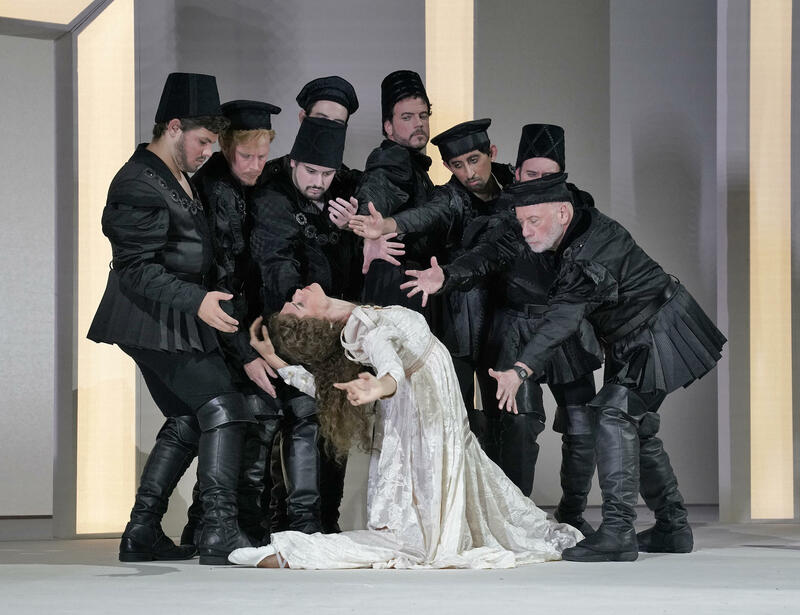 Rigoletto is performed on a minimal set – squared-off bare walls with upstage doorways and chairs and stools brought on as the only places for the singers to sit. The stage is divided by a line of light to indicate the inside and outside of Rigoletto’s home and later the inside and outside of the assassin Sparafucile’s house. The costumes suggest the Renaissance Italy period, black for the men and white for women with only a couple of exceptions. Both are outraged fathers. Count Monterone, whose daughter has been ravished by the Duke, and who has been provoked by Rigoletto’s jabs to curse the jester, wore a cloak which set him apart from the rest. This was luxury casting with the Metropolitan Opera veteran John Cheek. Rigoletto’s traditional jester costume is in shades of grey. The staging includes two dancers who represent the interaction between the Duke and Gilda, with the chorus making stylized movements, sometimes clustering together as a unit. Sunday's performance was sold out, so it may be difficult to obtain tickets for August 28 or 31, but if you can get one, you'll see a great opera well performed.